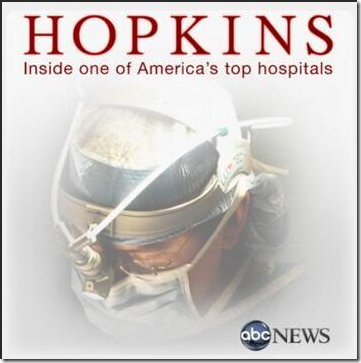 Nearly eight years after the critically acclaimed series, Hopkins 24/7, ABC News returns to Baltimore’s Johns Hopkins Hospital for a new six-part documentary entitled Hopkins, which delves even deeper into the world of caregivers at this hospital. Hopkins offers a rare look at the impact this high pressure profession can have on doctors’ personal lives. For four months ABC News’ high definition cameras had unparalleled access to this legendary hospital and to more than a hundred caregivers and patients who gave their consent to be filmed. Hopkins captures astounding scenes of medical crisis, with young doctors forced to make life and death decisions on the fly. The result is a stunningly intimate portrait of the men and women who call this hospital home. Hopkins premieres THURSDAY, JUNE 26 (10:00-11:00 p.m., ET), and will continue for five subsequent Thursdays through July on the ABC Television Network. Culled from nearly 1500 hours of footage, Hopkins contains scenes that are remarkably raw and private. Viewers will watch as doctors pose the wrenching question to the family of a nearly drowned little girl about whether to disconnect life support, since her brain function is minimal. They’ll experience the tension when a young surgical resident punctures a woman’s lung during a routine procedure, and will also learn about the unlikely journey of an illegal migrant worker picking tomatoes in California who rises to become one of the nation’s top brain surgeons. Hopkins examines the interplay between the public and private worlds of the men and women who wear the white coats. A young cardiac surgeon and his wife allowed ABC News’ cameras to witness some of their most difficult and sensitive moments as they confront a crisis in their marriage. There are no narrators in Hopkins; the voices belong to the patients and doctors. Interwoven storylines unfold in cinéma vérité sequences. 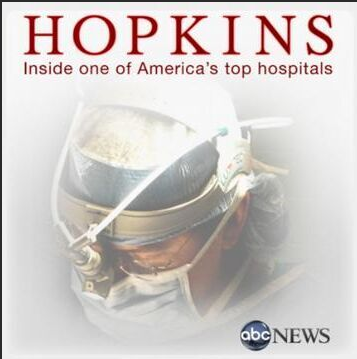 Since Hopkins 24/7 aired in 2000, there has been a revolution within the culture of the hospital. During the first series, the chief of surgery told ABC that women didn’t have &quot;the stamina&quot; for his field. Today women at Hopkins have breached the walls of medicine’s most macho preserve. The chief of surgery is female, and roughly 20% of incoming surgical residents are female. And even though residents’ workloads have dropped by a third since ABC News’ last visit, in Hopkins young doctors are still struggling to balance quality of life issues. Additionally, while America’s preeminence in medicine partly depends on a handful of academic medical centers like Hopkins, the future is far from secure for these great hospitals, which face budget cuts that jeopardize their mission of training, research and innovation. Hopkins is a revealing look at life inside the walls.